Boston Celtics Captain Paul Pierce, aka The Truth, and playmaker Rajon Rondo both boasted chart-breaking performances last week. Pierce is coming off of the best shooting year of his All-Star career in 2009-10. He posted personal bests in FG%, 3-Point FG% and FT%. 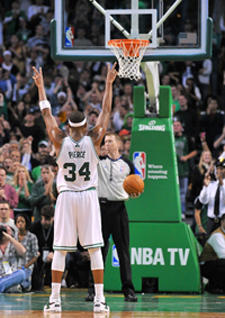 On November 3, during a game against the Milwaukee Bucks, Pierce scored his 20,000th career point on a free throw. He is only the 36th player in league history to reach 20,000 points, and just the third Celtic along with John Havlicek and Larry Bird. The 8-time NBA All-Star was the MVP of the 2008 NBA Finals. Pierce is still the Celtics’ go-to guy when they need a big basket, and he’s presently their leading scorer after 6 games with 19.3 PPG. In addition he is shooting 93% from the free throw line and grabbing 7 boards a game. 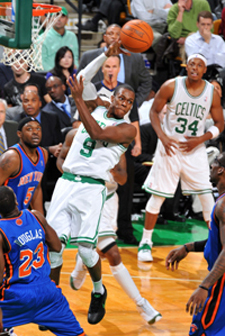 Teammate Rajon Rondo also got off to a sensational start for the Celtics, attacking the record books nightly. On opening night Rondo put up 17 assists against the Heat to tie with Oscar Robertson for the third-most assists in a season opener. In the third game of the season, Rondo dished out a career-high 24 assists to combine with 10 points and 10 rebounds for a triple-double against the New York Knicks, joining Isiah Thomas as the only players in NBA history to have at least 24 assists in a triple-double. Rondo’s total of 50 assists through the first three games of the season tied John Stockton’s NBA record for most assists in the first 3 games of the season. And in the next game against the Detroit Pistons, he finished the game with 17 assists for a total of 67, which is the most assists in any team’s first four games in NBA history. With a 15-assists effort the following day, Rondo again set a record for most assists through the first five games. He is averaging 15.5 APG, 5.5 rebounds and almost 3 steals per game so far this year.